David Spade Sued by Krista Allen He Stole My Show!!! 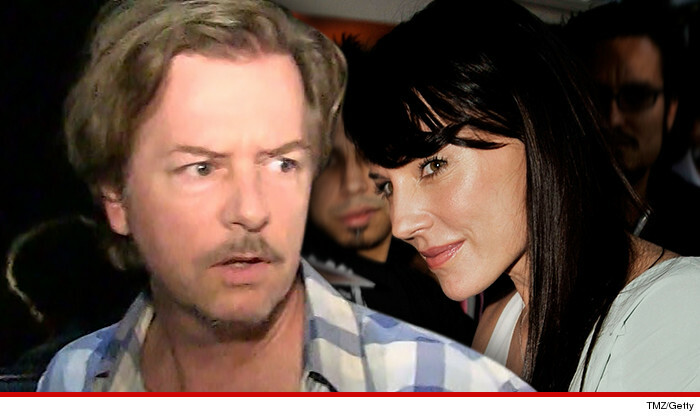 David Spade Sued by Krista Allen -- He Stole My Show!!! David Spade has always been a ladies man, but he just lost one for good ... comedian Krista Allen, who's suing Spade for allegedly screwing her out of a TV show. According to Krista's lawsuit -- obtained by TMZ -- last year, she came up with the idea for a show called "Frauditions," a fake talent show in which participants are conned into participating in front of actors posing as judges. Krista says she pitched her idea to David and he loved it, and they agreed to an even split of profits. But she says things went majorly south when the show went into development and David's lawyer tried to change the split from 50/50 to 70/30. In the end, she rejected the proposal. Come to find out ... David produced and hosted a show called "Fameless," which Krista says is a ripoff of "Frauditions." "Fameless" is airing on truTV. Krista -- who's appeared in "Liar Liar", "Anger Management" and "Spin City," was rumored to have dated David in 2001. She wants more than a million bucks. We reached out to Spade ... so far no word back. 'Empire' Sued Again -- They Stole My Show ... And I Want $500 Million!